Some days you might feel confident you can meet your needs within the boundaries of your current income, whereas other days you may feel like you don’t have nearly enough funds in order to do so. The truth is, you’re not alone. 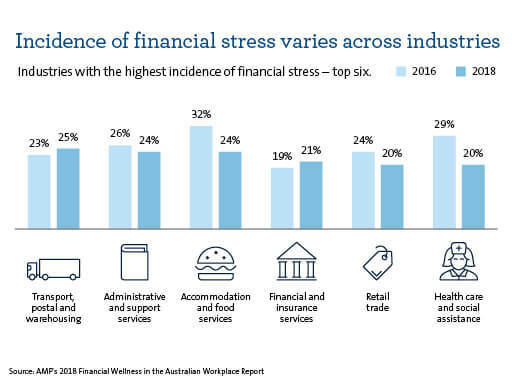 Nearly 2.5 million Aussies say they feel moderately to severely financially stressed, even though financial stress has been decreasing year-on-year in Australia1. 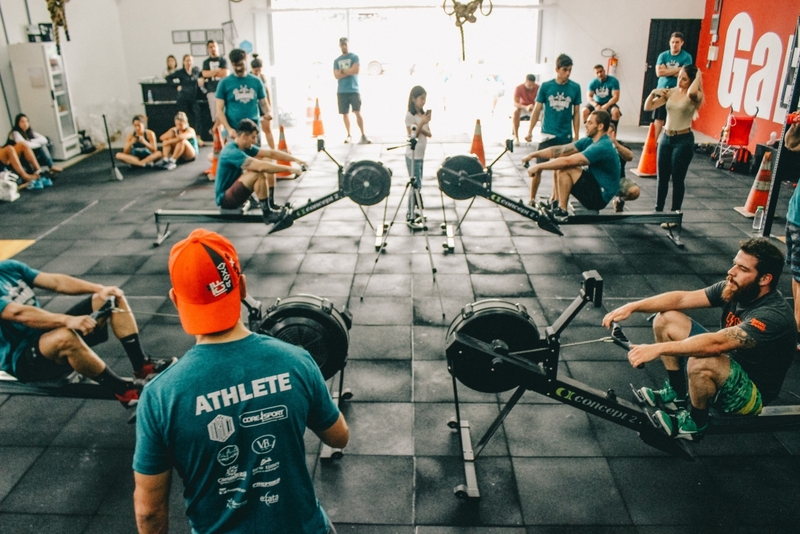 If you’re interested to know more, we take a look at some of the findings that came out of AMP’s 2018 Financial Wellness in the Australian Workplace Report, in addition to what steps you could put in place to potentially improve your financial position and wellbeing. 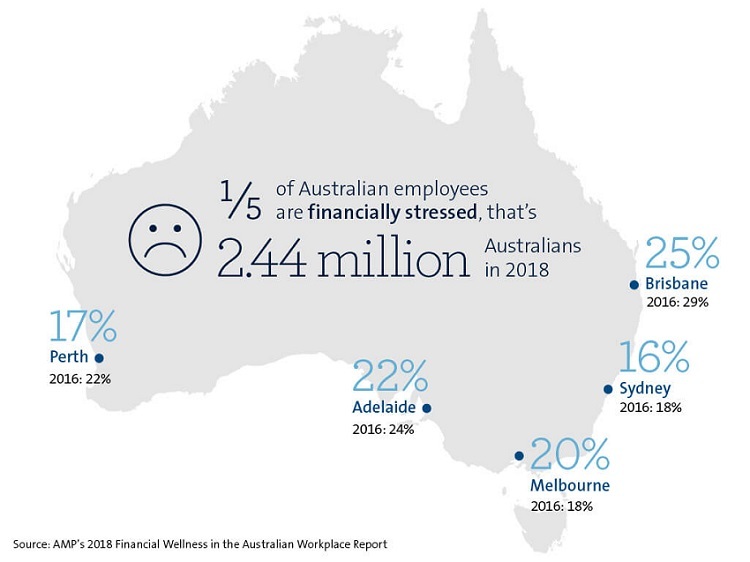 The number of Aussie employees feeling financially stressed across the board in 2018 was 19%, down from 22% in 2016. In comparison to 2014 research, Aussies also indicated they had greater disposable income than in years gone by and were spending more money. Research participants in 2018 also said they felt more confident in dealing with financial matters and with their own levels of financial understanding. Compared to two years ago, fewer people said they were engaging in negative financial behaviours, such as making late repayments on bills and credit cards. At the same time however, there was a decline in positive financial behaviours, such as people making additional repayments on mortgages and putting aside savings for a rainy day. Of those working Aussies that did indicate that they were financially stressed, this was being felt across all industries, income levels and roles. On a positive note, research identified that those who have been financially stressed in the past were often able to recover through changes to their behaviour and mindset3. Here are some suggestions of things you could do (if you aren’t already) which may help you to improve how you feel financially. When it comes to creating a budget, try jotting down into three categories – what money is coming in, what cash is required for the mandatory stuff (such as bills), and what dough might be left over (which you may want to put toward existing debts, savings or your social life). Writing up a budget may take an afternoon out of your diary, but it will help you to more easily identify where there’s room for movement. For instance, could you reduce what you’re spending on luxury items, subscription or streaming services, eating out or clothing? If all the small debts you once had, have multiplied and grown into bigger debts – you could look to roll them into a single loan, and reduce what you pay in fees and interest. This could help you to save a significant amount of money (depending on what you owe) and make it easier to manage your repayments, as you’ll potentially only need to make one monthly repayment rather than having to juggle several. The main thing to ensure is you are paying less than what you are currently when it comes to interest rates, fees and charges, and that you’re disciplined about making your repayments. Even a small amount of cash deposited on a frequent basis could go a long way toward your savings goals, with a separate research report indicating the average savings target for Aussies is a bit over $11,0004. Some tips people said helped them along the way was transferring spare funds into an actual savings account, setting up automatic transfers to their savings account (so they didn’t have to move money manually) and putting funds into an account which they couldn’t touch5. With research showing that an emergency fund of between $4,000 and $5,000 is generally enough to cushion most working Aussies when it comes to unexpected expenses, it’s probably worth some thought6. An emergency stash of cash could give you peace of mind and reduce the need to apply for high-interest borrowing options should you be faced with a busted phone, car tyre, or bad landlord or lover leaving you financially stranded. One in two Aussie couples admit to arguing about money7, so if you haven’t already, it might be worth sitting down to ensure you’re on the same page and that both parties’ goals are being considered. Understandably, it may not be the easiest topic to broach, so if you’re looking for some tips, check out our article – 10 money conversations to have with your other half. You more than likely have several product and service providers, and figures show you could save more than a grand annually on energy alone just by switching from the highest priced plan to the most competitive on the market8. Again, this may take a couple of hours out of your day, but the savings you could potentially make may make a real difference to what you cough up throughout the year. If you are struggling to make repayments, you may be able to seek assistance from your providers by claiming financial hardship. All providers must consider reasonable requests to change their terms in instances where you may be suffering genuine financial difficulties and feel help would enable you to meet your repayments, possibly over a longer period.